Today’s Mall at Ulu Tiram is the latest development by Today’s Holding Group Sdn. Bhd. The company has previously developed and enjoyed great success since its first project – Today’s Market at Seri Alam, Masai. Today’s Mall is built along Jalan Kota Tinggi, surrounded by many housing estates, with a population of more than 300,000 people within its 5km radius. It is the first, the only, and the biggest shopping center not just in Ulu Tiram, but the North-Eastern part of Johor including Kota Tinggi, FELDA, Mersing, Endau etc.. The nearest shopping hub to it is currently the old Ulu Tiram town, made up of shop-houses. 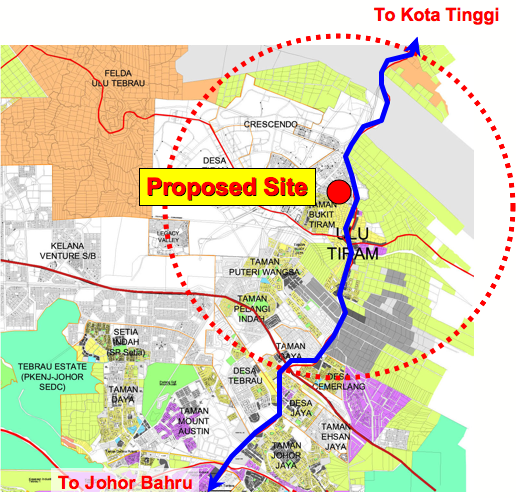 Today’s Mall, Ulu Tiram is easily accessible through the Tebrau Highway, the currently upgrading Jalan Kota Tinggi trunk road, and the Senai-Desaru highway. The population makeup of Ulu Tiram is 56% Malays, 33% Chinese, and 11% Indians and others. The target market for Today’s Mall is the low-middle income group. Our goal is to provide wise consumers with a shopping environment constitute of a variety of qualitative goods and services of reasonable prices. In Today’s Mall, we integrate 5 must-haves all at one place to provide shoppers with the utmost convenience. The 5 include: 1) superstore (hypermarket) for groceries and daily products, 2) foodcourt and restaurants for eatery, 3) a cinema, karaoke, and amusement centre for hang-out, fun and entertainment, 4) GADGET CENTRE for IT, handphones, and photography equipment , and 5) retail shop lots of a wide variety of other goods and services for shopping. Today’s Market and Today’s Mall are two totally two different concepts altogether. The latter is a 3-storey fully air-con contemporary shopping center, covering almost 10 acres land. Its gross built up area is approximately 800,000 square feet. It’s also worth mentioning that this premise provides more than 1,000 free parking spaces, with 24 hours security, made up of 250 shop lots, and areas designated for exhibition, promotion, kiosks, booths, and etc.